When I drive along Sunshine Road, I always admire the bronze sculpted Banksia seed lights that light up the median strip at Noosa Junction. On Saturday I got to meet the artist, Lucas Salton. 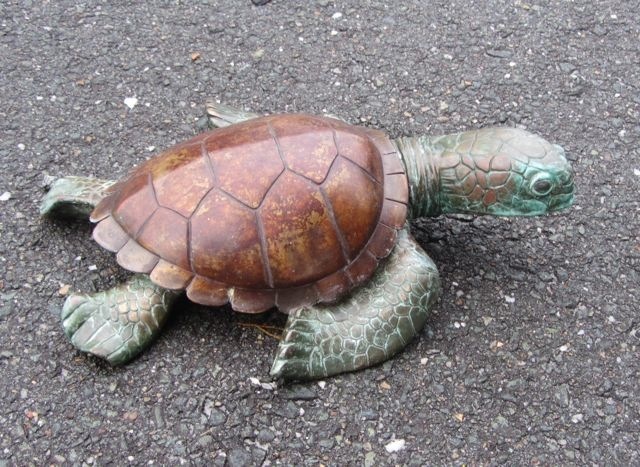 This is one of his little bronze turtles. If you are local, check them out in situ in the beautiful street scape around the Coolum Surf Lifesaving Club. Lucas, like many of us with an artistic bent shares a love of Nature, the greatest creator of all. Heeding a call from the Give Back Project, he and his lovely family came over from Nambour to help at the Marcus Beach Bushcare Group community working bee. Thanks guys. Many hands make light work. We did a makeover of the little Hawthorn Grove Playground worthy of Better Homes and Gardens.